Nosebleeding is a symptom, not an illness in itself. If your dog suddenly has nosebleeding, it can be rather frightening. However anxious you may be, though, try to stay calm - remember, dogs can pick up on people's feelings and emotions. 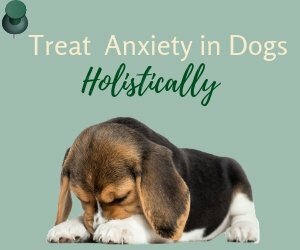 If you are panicky, your dog will be anxious and stressed as well. Stress can cause blood pressure to rise, resulting in more bleeding. So stay calm and try to calm down your dog as well. 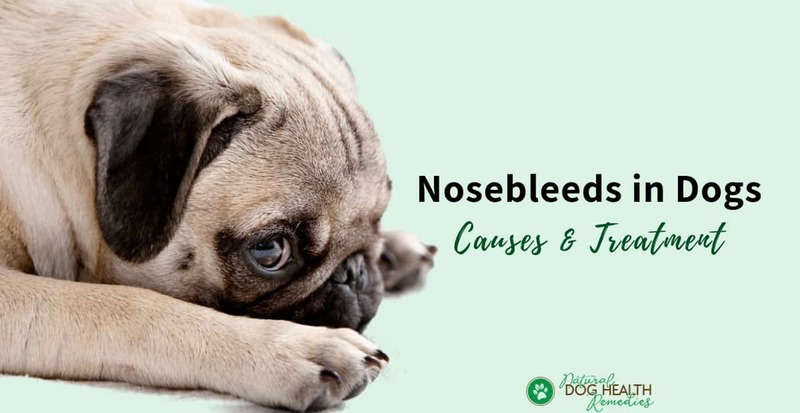 What causes nosebleeding in dogs? How to deal with nosebleeds in dogs? Read on to find out. Small foreign objects (such as seeds, blades of grass, foxtails, etc.) that have found their way up the nasal cavity can cause violent sneezing and irritation to the nasal lining. Violent sneezing and irritation can result in nosebleeds. Severe nasal infections caused by bacteria or fungal organisms can result in sneezing and nasal discharge. The discharge can be mucoid (thick and slimy), purulent (pus-like), or bloody. Allergies that cause chronic inflammatory conditions can also cause sneezing and nasal discharge, sometimes bloody due to violent sneezing. Some parasites (such as nasal mites) are sometimes found in a dog's nasal cavity. They irritate the nasal lining and cause itchiness resulting in sneezing as well as nasal discharge. Usually in the case of parasites, however, the discharge is clear and serous. Trauma to the head, face or nose can cause nosebleeding. If your dog has a problem or disorder that makes his blood unable to clot, the first and most common sign is nosebleeding. Nasal cancers usually are slow growing but are invasive and difficult to treat. It is therefore important to consult a vet if your dog has frequent nosebleeding, especially accompanied by any of the above symptoms. As dog nosebleeding can be a sign of some serious disease such as cancer, it cannot be taken lightly. Monitor the nosebleeding carefully. Is blood coming out from one or both nostrils? If blood is coming out from one nostril, it might be caused by a small foreign substance (e.g. seed) in the nasal cavity. If it is from both nostrils, then your dog could have an underlying disease, such as nasal infection. Is there bleeding (or bruising) from other parts of the body? Check your dog's mouth and see if his gums are bleeding too. If it is, this may point to a bleeding disorder. Has your dog been in a fight with another dog? Or has he hit his head by accident on a tree or something hard? 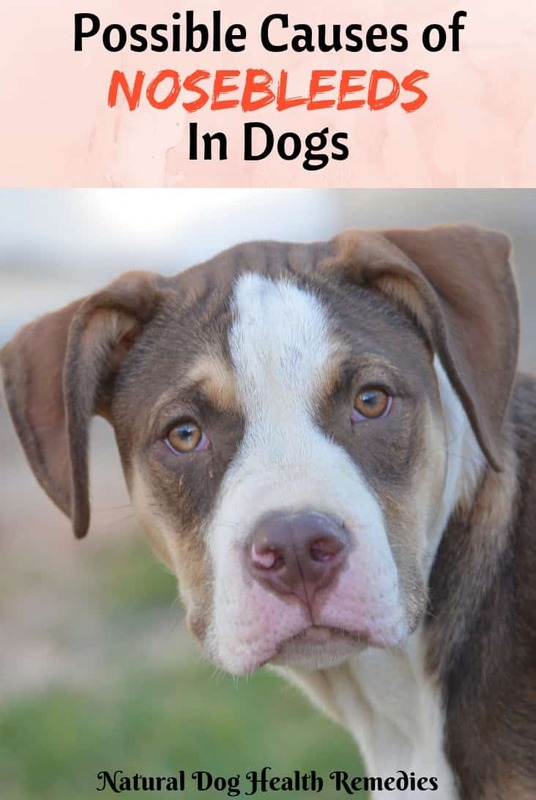 If your dog has been involved in a recent dog or cat fight, or has had some trauma to his head, then possibly that's what causing the nosebleeding. 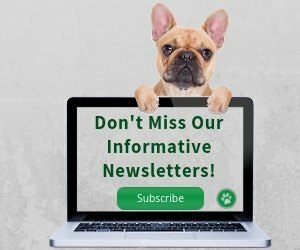 Is there a change in the shape of your dog's nose? Or is there any facial swelling? If there is, this may be indicative of nasal cancer. If your dog is old and has frequent nosebleedings, this may also be an indication that he has cancer. Nasal cancer is more common in older dogs. The best first aid care for a dog nose bleed is presssure and cold applications. Put an ice pack or even a bag of frozen beans on the dog's muzzle. Also, keep the dog's head elevated if possible. Keep your dog (and yourself) calm. Remember, stress can make the bleeding more profuse. Arnica is indicated if your dog has nosebleeding after an injury, which may or may not be directly to the nose. 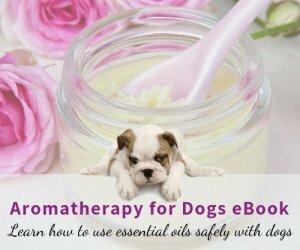 Dogs needing this remedy are in great pain and therefore fearful of touch. This remedy is indicated if your dog has nosebleeding and a fever. The dog may have pale gums and the blood is usually bright red. Dogs requiring this remedy has long-lasting bleeding. The blood may be dark and foul smelling and the nose is sore. 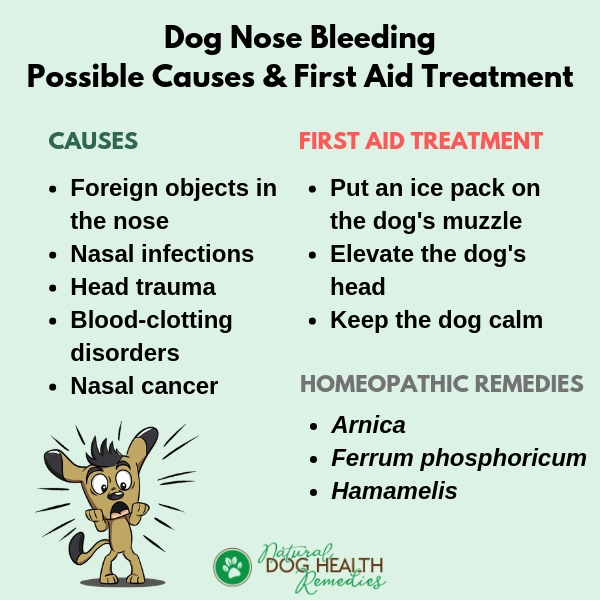 Remember, even if you can stop the nosebleeding using one of the above remedies, it is advisable to consult a vet afterwards for a proper diagnosis of any underlying cause or health problem, especially if the nosebleeding recurs.